Pocket pH Testers for Testing pH Levels in Water | Applied Membranes Inc.
Portable pocket pH monitors are ideal for measuring the pH levels of water from 0-14 pH range. Their compact size makes them ideal for use on the go. Testing is fast and easy: Simply turn on the meter, immerse it into the solution to be tested, stir gently, and wait for the pH reading to stabilize. 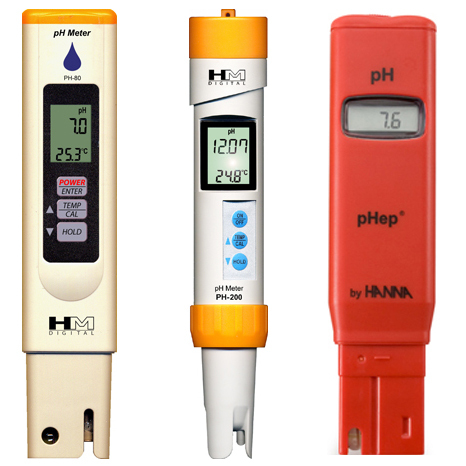 Pocket pH Testers offer a simple, inexpensive solution for accurate pH measurement. Economically priced water resistant pH meter measures pH & temperature with auto-off, data-hold function, and low-battery indicator. Waterproof pH meter measures pH & temperature with auto-off, data-hold function, and low-battery indicator. Hanna pHep® Pocket pH tester with LCD measures pH. Ideal for monitoring pH in laboratories and industrial applications as well as in agriculture, fish farming, food manufacturing and quality control, swimming pools and the printing industry.